Phillip and Brian podcast live for the third time from #Shoptalk2019! Why does anybody think giving free haircuts at a conference is a good idea? Shoptalk launches Retail Club to help retailers and merchants network. Boring brands continue to die off because they are not engaging with customers. Paypal Credit is a familiar face on the Shoptalk marketplace floor. Brian regrets not getting a free haircut at Shoptalk, though why there are free haircuts at a conference is confusing, and slightly unsanitary. Maybe the free haircuts are connected to the abundance of payment providers because all the money that people would have spent on a haircut, or makeup, they could spend on their payment solution. Are Shoptalk attendees channeling Alex Honnold from Free Solo? Phillip points out that there are puppies everywhere at Shoptalk, it's true, and it's fantastic. Lianne joins the show to bring some millennial perspective and literally drops her mic. Stylitics, a B2B outfit, and styling technology company was impressive, their new feature of allowing the customer to curate outfits in-store is going to change the in-store shopping game. Phillip uses the term hornswoggled, which apparently makes him old. One of the best sessions at Shoptalk was Marc Rosen EVP at Levi's keynote: and he was wearing Levi's jeans which made the session all the better. Levi's is re-inventing itself by offering customers customizable options, which in the era of personalization is an excellent idea. Levi's is a pretty ancient brand, starting out over 165 years ago, by creating better jeans for miners to wear while they worked, the original customer feedback loop. One of the best places to meet exciting brands at Shoptalk? The breakfast and lunch tables. Phillip had the opportunity to chat with Adidas Speed Factory, Adidas had a very similar story to Levi's in regards to the evolution in the supply chain, and now they're making products closer to fulfillment, cutting down on the time it takes to make each product. Brian and Lianne had a long conversation with Flowers Foods, who have acquired a new line of gluten-free bread, which will save Lianne from missing out on bread. And there is no better way of getting Shoptalk attendees to connect, then over food and coffee. And a company that is not to be named was overheard talking about how GDPR is already causing pain for U.S based brands. Which answers the question as to whether GDPR will have an impact on large companies, because the multiple companies heard talking about pain points, are not small business. Why Isn't Anyone Talking About Voice? 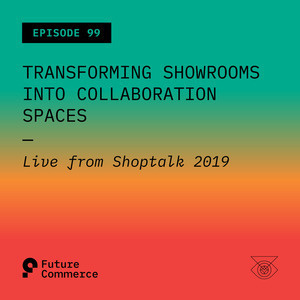 In the Future Commerce pre-Shoptalk show, Phillip questioned why almost no one was talking about voice-technology at the show. Brian says that the capability for voice tech isn't there yet and that it's not conducive to commerce. There are no retailers displaying voice technology at Shoptalk. So what is the future of voice tech, and how will companies implement it into existing strategy? One brand that is talking about voice is KFC, who we heard from at Future Stores Miami, but they're using it to enhance the experience of their employees. The founders of Shoptalk just announced Retail Club, which is a year-round localized club as a way for retailers and merchants to meet, discuss, and network. Hopefully, this will be a great way to build out localized communities. "Part of the future of commerce is making sure that retail becomes a more sustainable place for people to work and grow." Brian caught Next Generation Shopping Experiences with Emar Malls and Rent the Runway, in which interviewer Ian Friedman from Goldman Sachs Investment Partners questioned the panelists about clientelling, which we all know is the theme of 2019. E-commerce providers are incredibly tribalistic: Why? Phillip points out that while e-commerce providers are tribalistic, customers themselves don't care which provider they're using as long as those platforms provide the needed services. Customers care about having a joyful experience, and that doesn't include search and browse anymore. Levi's is bringing customers an experience they'll be able to appreciate, bringing the tailor shop into the center of the store, in order to have a conversation with every customer. And digital retailers are having a brick-and-mortar renaissance, bringing customers into the actual conversation. One major theme at Shoptalk is the announcements regarding store closings. So who's dying... cough closing? Victoria Secret, Elf, Gap, Tesla, etc., with over 5500 store closings projected this year, and it's only March! And while some retailers are liquidating their retail space, in another corner retail space is being re-purposed. Brian loves talking about Elon Musk. Will Lyft and Uber start demanding government subsidies in 5-10 years? And Walmart who has decided not to be boring had an excellent 4th Quarter. And somehow Best Buy has survived the "retail apocalypse" and is thriving, could anyone have predicted that? The "retail apocalypse" is as we all know, just the end of boring retail.